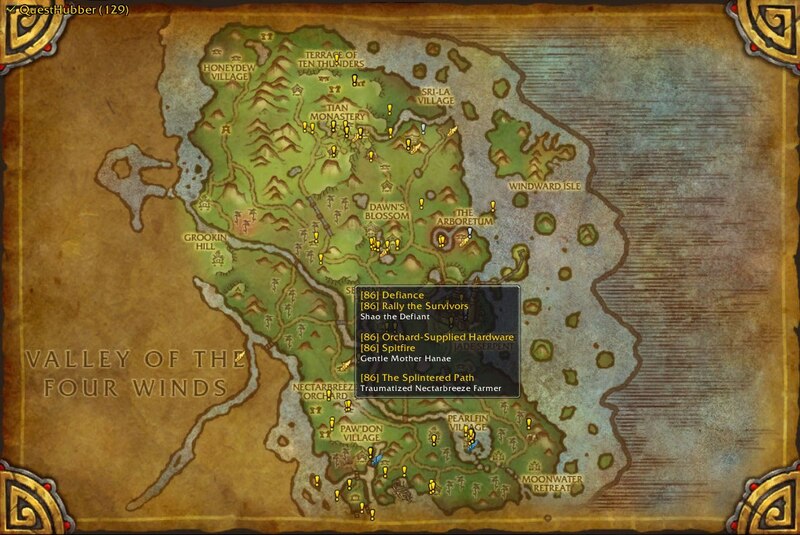 QuestHubber is an addon that was designed to show pinpoints on the world map of all the quests you've missed. Between data personally collected by myself, data submitted from other users, and data that I obtained from Wowhead via a crawler script, there are over 7,000 quests for Alliance and Horde from every zone and continent in game currently—including the new Cataclysm zones. Because much of the data from the old zones is very new and Wowhead does not seem to be 100% correct, you may notice some incorrect positioning, missing quests, or quests from the opposite faction, but in my experience these problems are not intrusive at all. Note: If you used an older version of QuestHubber, you may also have the addon QuestGather in your AddOns folder. This was an optional addon that was bundled along to help collect data, but it is no longer necessary. Feel free to delete the QuestGather folder. I don't want to switch, because it has a TON of stuff (feature bloat) that I don't care for. I'm more than willing to assist you in anyway I can. Ah yeah, I remember this guy originally used a modified QuestHubber as an interface for his Grail database before making Wholly. Honestly, I can't say much since he doesn't provide much in the way of screenshots, but it looks like he has a better managed database and an interface that does what QuestHubber does and then some. Why not consider switching? As much as I would like to update my addon, something as complicated as grouping and counting dailies would be near impossible without an active account. You can look at how the author of the Wholly and Grail addon combo removes unavailable daily quest pins from the map. I haven't checked the code yet, but I imagine they're keeping a list of the dailies for each hub/faction. From there, they're either disabling the rest once you've completed the maximium completable for that hub/faction or they're further grouping the quests based on which are interchangeable. Obviously, only a handful of these are available each day. As far as I know, there is no way to determine which of the dailies a character can do that day, so you would end up seeing pins on your map for all 300 dailies. When you complete one, it would remove the pin for the day, but that is hardly helpful in determining what you need to do. If I am wrong, and you know of a method or another addon that can figure this out, let me know, but for now I'm going to leave it as it is. Augh, well that's depressing. It looks like all the daily quests for the world events are no longer tagged as being world events, so I can't avoid them as easily. I'll find queries that work and get a new data update in. Almost all of the dailies in Pandaria are still missing from the map. Data was updated from Wowhead. Sorry for the wait. If you see any inconsistencies, let me know, as I do not have an account to verify the order of things. Yes, by now all of the dailies should be in the database, yet Questhubber does not show any of them on the map. It would definitely be great if we could get some updated Wowhead data loaded in, especially for the dailies as there are SO many! Can we get a new release with updated Wowhead data? There were a number of dailies incorrectly identified as quests in the last version. Hmm, the way I have it set up right now is to continually check the return from GetQuestsCompleted() until you actually get something, so if it doesn't grab it immediately, it should eventually. I never managed to figure out if it is only available after a certain event. If it still doesn't have the data, then it's hard to say what's going on. You could manually dump GetQuestsCompleted() to see if the data is there at all, and you can dump QuestHubber.playerQuests to see the reference that it thinks it has. See if there's any discrepancy there? it worked fine until this morning, out of blue it started showing ALL quests again instead of just ones i haven't completed. i've tried relogging, and waiting great lengths of time whlie logging in. it just doesn't seem to be querying server and updating completed quests anymore, it's just flat out showing all and leaving it that way. This makes it unhelpful. any thoughts? Thanks for the fast resolving. Thanks, I updated some data files last night and looks like I accidentally screwed up the deployment to Curse. It should be fixed now. thanks for this great addon. Is there a trick to activate it? I'm not seeing this addOn in the character addOn overview like my other addons. And yes, i have correcttly installed thsi addon in the addon folder, like my other 50 addons :). Everything should be updated to work with 5.0.4. If there are issues, please leave a comment describing what is wrong. Edit: No new quests have been added to the database, this was merely a small patch to get things working again as they were before. I will look into updating the database for Mists, however. short question...will there be a version for MoP?